The SPbU team have defeated their competitors from Harvard University, ITMO University, Massachusetts Institute of Technology, Shanghai Jiao Tong University, Lomonosov Moscow State University and other HEIs, with a total of 130 teams. According to the rules of the contest, each team included three students with one computer and a set of mathematical problems. In order to win, a team has to solve the biggest number of problems; in case of a draw, the victory goes to the team that has completed the tasks in the shortest time. SPbU representatives have already won the contest three times: in 2000 and in 2001, when the legendary team included Nikolay Durov and Andrey Lopatin, who later became lead developers of the Vkontakte social network; and in 2014, when the contest was won by Egor Suvorov, Dmitry Egorov and Pavel Kunyavsky, who had been coached by Andrey Lopatin. 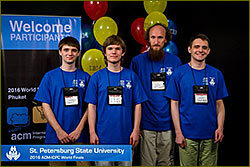 For the past three decades, the ACM International Collegiate Programming Contest has been the most prestigious intellectual competition for young programmers in the world. The contest operates under the auspices of the Association for Computing Machinery (ACM) and is sponsored by IBM. Tens of thousands of university students from all over the world take part in the contest annually. They are the most talented young programmers, winners of international academic contests and competitions. The first team competition under the auspices of ACM was held at Texas A&M University in 1970. The contest evolved into its present form in 1977, with the first Finals held in conjunction with the ACM Computer Science Conference. City news archive for 20 May' 2016.